The original mattresses on board were rather uncomfortable and my wife was not to keen on sleeping in a bed which someone else had used for 10 years. They were also heavy (coil spring) and made bed making cumbersome. Finally got around to changing both the master and guest mattresses. Problem here is they are shaped rather strange so customization was required. Decided to go with an Ikea mattress as the quality is outstanding and the price is right. We were able to lay down on several models and choose what we liked. 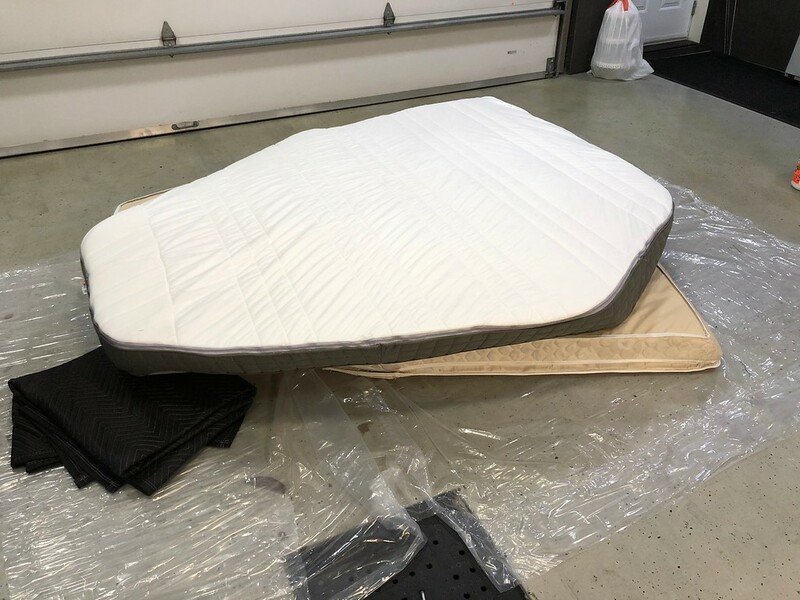 We did ask around for "professional" mattress but the bottom line is they give you a chunk of foam cut to size to the tune of $1000 for something you may not be comfortable on. Required a Queen size to fit the master. The guest required a king and even this was not big enough due to the weird bow shape/fitted design. Luckily the waste after the cut was big enough to glue the missing piece into place creating an identically sized copy of the original. Used a spray adhesive made for foam which worked perfectly. The bow mattress (guest) also had angles on both side to fit the hull shape so this one was trickier than the master. Picture of the Guest mattress which was the complicated one, Master is the same but a different shape. Very pleased with the results. Now - your next assignment is to to make a set of custom sheets to fit the weird shapes. I have done several sets and they are not all that difficult. Measure mattress thickness and add several inches to fit under the mattress and to sew a hem in the bottom edge - I sometimes buy and extra sheet to have enough matching mat'l for the side pieces. Sew several side pieces together to have enough to go around the outside edge of the mattress - better to have too much than not enough. Sew a hem in one edge to put in elastic or a draw string. Insert a string as you sew the hem of after w/ a small snake pushed through the hem to pull the string back through. Sew the side to the top starting at a position that will be easily accessible when making the bed. - continue to sew until you approach the starting point - cut and finish the cut edge and complete sewing the side piece on. The fitted sheet can be placed on the mattress and the string used to draw it tight - I have used a slide lock similar to those used on jacket bottoms to hold the draw string. If desired you can use the string to pull an elastic through the hem and tie the end together to provide a fitted sheet w/ an stretchy side panel fit. Nice job. Looks like you will have comfortable sleeping aboard in the near future. Tried the master mattress for the last 4 nights, heaven. Had my daughter up front and she was very pleased. Overall it was a great upgrade. How much did you spend on the Ikea matresses? There is a link to the mattress in the initial post. All depends on what size you need. I my case it came to $800 CDN for both. Probably cheaper in the states. I found a mattress manufacturer that is in Sacramento, CA. He is building mine using the old master cabin mattress as a guide. It is $600 delivered. I should have it back in a week or 2.